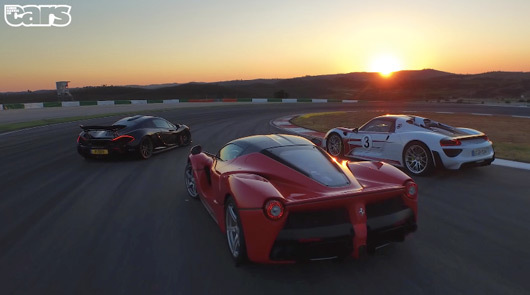 In the name of the P1, the 918 and the holy LaFerrari. It’s the video we’d all been waiting for. After a bit over two weeks it’s racked up more than 1.2 million views. It’s Chris Harris in three of the most desirable cars ever made. At almost one hour long the recipe couldn’t get any better. Throw in an empty and excellent Portimao racetrack and, well, yeah, the recipe does get better. And this video is great viewing, it really is. But is it as good as you were hoping? On the fly laps, I personally think Chris had the most aggressive driving on the P1, and the lightest being on the 918. On the Ferrari, I think he made 2 quite costly mistakes on several turns which resulted in a little time loss, and ultimately a difference of roughly half a second Vs. P1. Anyway, I do think the P1’s onboard lap looked to be the most well composed car on track. I’d take the P1 any day of the week. Video is really very catchy. Great one thanks! epic vid thanks for posting Liam. I’d take the P1 any day it actually looks a lot smaller in person. Kudos to the 918 though. Ferrari is a bit disappointing though.